Large beach resort with endless fun for all ages! Week 14 every year! Inquire for more details! Centered in the developing North End of Virginia Beach, the fabulous *Ocean Beach Club - Virginia Beach* is a contemporary beach resort with a Key West motif that will encompass nearly two blocks of Atlantic Avenue in Virginia Beach! 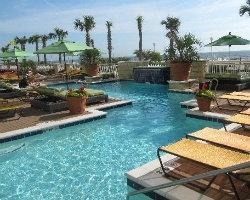 Phase II, a 19-story tower, is located on the oceanfront with one, two, and three bedroom units. Fully equipped kitchens, whirlpool tubs, rainforest showers, and private balconies are just a few of the many amenities. Resort guests are near restaurants, shopping, and attractions including museums, championship golf courses and more! Colonial Williamsburg and Busch Gardens are not far away. To discover more, visit www.diamondresorts.com. *Interval International Premier Resort* Featuring a finely appointed 3 bedroom, 3 bath suite that will accommodate 10 guests comfortably. Usage is annual in week 14. Maintenance fees paid annually. For more information or to make an offer, please submit the inquiry form.